Matt and Des both inviting Candice to dinner. Melanie tries to leave but Matt thinks she should be Des' date, Des think she should be Matt's date but Melanie wants to go to Chrissie's! Melanie agrees to stay as Des and Matt fawn over Candice. The boys head over to the kitchen and continue to argue. 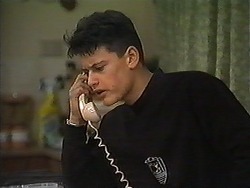 Josh rings Cody to see if she wants to come over but Cody says her Mum won't let her, she's busy tomorrow also. Cody tells Josh that they've been seeing too much of each other, Cody says she wants to be friends; Josh hangs up and is upset. Ryan offers to wash up despite it being Lochie's turn. Ryan wants to do the gutters, Dorothy says there's no need but Ryan insists. DOROTHY: Oh come on, out with it, you've broken something? Lost something? You want to join a rock band? You've got a tattoo? It turns out Ryan wants some money to save for a car, his Coffee Shop hours aren't enough now Eddie is there, Dorothy says she will think of something. The living room is full of office plants! Chrissie is here and says they should move them. Kerry suggests Dorothy's green house, Joe isn't keen as he thinks she'll say no but Kerry says he has to ask her. Des is talking about balance sheets! Candice asks about foreign economic news, Des doesn't quite know what to say. Candice tells a joke that no-one gets. Matt tells her about being a mechanic but Candice says there should be more public transport, this doesn't please Matt. Melanie then shows Candice her pigs as the boys stare at each other. Todd, Josh and Melissa have pizza; Josh tells them about Cody dumping him. Josh asks Melissa to ask Cody why she dumped him. Melanie has loads of pigs spread out over the floor, the boys are looking bored. Candice's friend arrives outside, they are off to a club, she asks the boys but they decline when they find out that the friend is male so Melanie goes instead! Dorothy is looking at the paper for suitable jobs for Ryan. Joe arrives and asks Dorothy whether he can put his plants in her shade house, Dorothy eventually agrees and makes Ryan go and help Joe move them. Todd, Melissa and Josh discuss Cody, Melissa says she spoke to Cody but she didn't say much, Melissa doesn't think there's anyone else involved. Josh sends Todd to speak to her. Ryan and Joe have moved the plants, Joe says Dorothy owes her one and Dorothy says he should take on Ryan. Joe refuses quite vehemently; Dorothy says if he doesn't take on Ryan the plants have to be moved again! Joe agrees to a trial. Todd approaches Cody who is sitting on the pier, Cody is pretty defensive when they discuss Josh, Todd wants to be friends but Cody says it's not that simple. Melanie is worried about typhoons and monsoons on her cruise, she has five suitcases, and two empty for shopping items! MATT: We're meant to say that to you! CODY: We can't be friends because I love you, stupid! She runs off but Todd grabs her, Todd says she should have told her before, he says Melissa isn't that interested anymore and they have much more in common. They lean in for a kiss.